If a piece is marked "sterling" or "925" it is a solid silver alloy made up of 92.5% silver and 7.5% copper. A little copper is added to harden the metal. Long ago silversmiths made most of their pieces from melted silver coins. Silver coins have never been made from pure silver. Copper was added, not just to harden the alloy, but also to help the mint stretch their supply of silver. The German principality of Esterling long enjoyed a high reputation for the purity and consistency of their coinage. Esterling coins were struck from an alloy of 92 1/2 parts of pure silver and 7 1/2 parts copper. This was the formulation settled upon by the English crown not just for it's own coinage (the Pound Sterling) but for manufactured silverware as well. To this day, the misuse of this stamp constitutes counterfeiting and until recently was punishable by death. Coin silver is from 80 to 90% silver, the rest being copper. Copper is added for strength. American coins were made like this until 1964. Back in the year 1300, the English passed a law saying that no silver would be sold without first being assayed and, if pure enough, stamped with a leopard's head. Sixty years later they added a provision that every silversmith should have, "a mark by himself, which mark shall be known by them assigned by the King to certify their work." The mark of the leopard's head, a cat shown full-face and wearing a crown, indicated that the piece was 92.5 percent pure silver; but also it was the mark that indicated manufacture in London. In 1544 a new mark was introduced to indicate the assay, the lion passant (a crouching lion facing left), and the leopard's head was added only if the piece was London made. All hallmarks were established by the Goldsmith's Guild in the towns large enough to support their industry. At some point, the Guild members came up with a system for dating their work using letters of the alphabet. Each year in May they would change to the next letter. It is important to note that each town used its own system. The year 1800 for instance, was noted by the letter 'E' in London, while in Birmingham it was 'C', and in Sheffield the letter 'N' was used. In London they used the letters A - U, excluding J, which gave them a cycle of 20 years. The thrifty smiths of Scotland used all the letters of the alphabet, as did many other regions. As a result, when trying to date a piece the first thing to do is establish the town of manufacture, then look up their date stamps; they're all different. The earliest known date stamps come from the late fifteenth century. Hallmarks, then, include a maker's mark, a town mark indicating where the silversmith worked, a lion passant which proves the assay, and a date stamp. This piece was made in Birmingham in 1926. Then in 1784 a fifth mark, a tax stamp﻿, was added. Shown on the left (turned sideways) this was an image of the king in profile. These marks indicate that the piece was made in London, in 1821. Please note that the order in which the marks are presented sometimes varies. The American silversmith was a little more straightforward. He simply stamped his name on the back, and he didn't care what year it was. Sometimes the word 'coin' will appear, since his spoons were all made from melted down coins; and sometimes there is an indication of the purity of the coins used: e.g., '800' or '850'. This one is a master list of reference material. Follow the links for an education in how to read hallmarks. This site is especially good for finding American silversmiths. If you have an old coin silver spoon with nothing on the back but the maker's name, you can find him (or her) at this site. What's the difference between brass and bronze? This is an easy one. Technically, any copper alloy is a bronze, and there are a lot of them. Pure copper is a soft red metal. Copper mixed with a little tin or arsenic is pink and much harder. This was the material of the bronze age. The silver plated flatware in your kitchen drawer is probably made of 'nickle silver', a copper and nickle alloy almost silver in color and very hard and tough. The mark 'EPNS' means 'electroplate nickle silver'. Brass is a soft alloy of copper and zinc with a rich yellow color. No, I don't have the skills necessary to make things out of silver. I am a tinker. Sheffield plate is term coined in the late nineteenth century but refers to silver pieces manufactured with a process invented in 1743 by Thomas Boulsover, a knifemaker who became a buttonmaker in Sheffield, England. A copper ingot is fused with a smaller silver ingot by hammering with heat and flux. This fused ingot is then hammered out into a thin sheet, cut and formed into candlesticks, pots and salvers (large trays). If the sheet was made with silver on one side only, the other side would be wiped with hot tin. Many Sheffield turkey domes were made this way. Often two silver ingots were fused, one on each side of the copper ingot, creating a sheet of material that looked like solid silver, only showing copper on the edges. The technique became widely used in the industrial towns of Sheffield and Birmingham, and was not replaced until the 1840's when advances in electroplating made the Sheffield process obsolete. During the Arts and Crafts movement, these pieces became collectable and reproductions were made. At this time, the term "Sheffield Plate" was popularized. "Thomas Boulsover was born in Ecclesfield near Sheffield in 1705. He completed an apprenticeship with Joseph Fletcher, a cutler, on November 26th, 1726. "Thomas married Hannah Dodworth at Sheffield Parish Church on 28th October 1728. "In 1740, Thomas was in business as a cutler in a workshop on the corner of Tudor Street and Surrey Street in Sheffield, opposite what is now the Sheffield Central Library. "In 1743, he was trying to repair the handle of a customer's knife when he made a mistake which was to change his future. The knife handle was very decorative, made form silver and copper. During the repair, Thomas had to heat the handle, but he heated it too much and the silver started to melt. "When he examined the damaged handle to see if he could recover it, he noticed that the silver and copper had fused together very strongly. Experiments showed that the two metals behaved as one when he tried to reshape them, even though he could clearly see two different layers. "Boulsover carried out further experiments in which he put a thin sheet of silver on a thick ingot of copper and heated the two together to fuse them. When the composite block was hammered or rolled to make it thinner, the two metals were reduced in thickness at similar rates. "Using this method, Boulsover was able to make sheets of metal which had a thin layer of silver on the top surface and a thick layer of copper underneath. When this new material was used to make buttons, they looked like silver buttons but were made at a fraction of the cost. "Strelley Pegge of Beauchief Hall loaned Boulsover the money to start a new business making decorative items from this new material which came to be known as Sheffield Plate. Boulsover set up a partnership with Joseph Wilson to make buttons, buckles, spurs and small boxes out of Sheffield Plate. The business was very successful and the process was soon copied by several other maunufacturers, including Matthew Boulton in Birmingham. "Joseph Wilson eventually left the partnership and set up on his own. Wilson added snuff making to his business. This snuff making business was the basis of the Wilson family's prosperity. The water powered snuff mill was operated in Sharrow, on the River Porter until recently. "Thomas bought Whitely Wood Hall from his friend Strelley Pegge in 1757 and moved his family out to these luxurious premises. "Shortly after this move, Boulsover became involved in the Trust which set up and operated the Sheffield to Leeds Turnpike. The Act of Parliament was granted in 1757 and the road was completed in 1759. "In 1760, he bought land just down the hill from Whiteley Wood Hall, on the River Porter, from the Duke of Norfolk. Thomas built workshops at the side of the river and used water power to roll steel products. The cottages he built for the workers at the rolling mill are still in use. He continued with the button making business at the old Fulwood corn mill further upstream on the River Porter. "Thomas' wife Hannah died in 1772 and was buried in St Paul's Church Sheffield. "Thomas died on Tuesday 9th September 1788 and was buried alongside his wife Hannah." "In 1742, in the garret of a small building known as Tudor House, a mechanic, one Thomas Boulsover, was repairing the blade of a broken knife. He accidentally fused silver and copper during this operation, and discovered that when these two metals were heated to a certain degree they became inseparable. He immediately realized that this strange occurrence might be turned to good purpose, and upon further experimentation found he was able to manufacture small bits such as buttons, boxes and buckles. These are the earliest known specimens of Sheffield Plate. "However Thomas Boulsover can hardly be called the father of Sheffield Plate, for although he discovered the process and introduced a few pieces, he was soon forced to abandon it. The man he employed to travel on the road to introduce his new product, cheated him outrageously and before long he was left without sufficient funds to continue. "But during the first few months of Boulsover's experimenting, he apprenticed a young man named Josiah Hancock. This young employee was a lad of great vision, and soon realized that the new industry might grow to huge proportions if properly managed. After diligent work he began to progress rapidly, and within a few years Sheffield Plating became a recognized industry largely because of his efforts. New pieces were created, faithful reproductions of sterling pieces were made and there was an increased demand for them, especially because excessive government taxation had forced the price of wrought silver articles to higher levels. The goldsmiths tried to combat the new industry by burdens of taxation and bothersome regulation but it prospered." Either way, a new age of silver ownership was born. The process was learned and improved upon by manufacturers outside of Sheffield, England. In Birmingham, Matthew Boulton (of steam engine fame) tried his hand at making it. Benjamin Franklin bought a piece here to send home to his wife, and he describes it in his autobiography. Soon middle class households were able to display silver on their tables like the wealthy. Ironically, it was the Boulton and Watts steam engine that made the process, at first more efficient, and then obsolete. 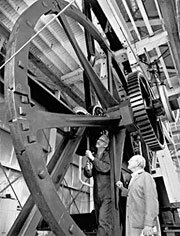 First, the steam engine made possible drop hammers much bigger and heavier than ones lifted by water wheels, and these bigger hammers could forge larger sheets of material more cheaply; but later it was used to power the new dynamo, producing a continuous flow of electricity. This made large scale electroplating practical; and, Thomas Bulsover's process being more expensive, it soon became obsolete. 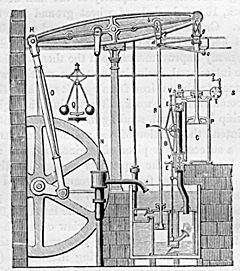 The Boulton and Watt steam engine, 1784. 35 hp @ 20 rpm! A large trip or 'tilt' hammer. By the 1840's, very few manufacturers were still using the Bulsover method and later, at the end of the century when collectors became aware of its history, the term 'Sheffield Plate' was introduced to describe the process. An assortment of electroplated reproductions then began to appear. These reproductions have themselves become collectable antiques. The invention of the battery in the early 1800's introduced the principle of electroplating - ions traveling from one sheet of metal through an electrolyte and bonding to another sheet of dissimilar metal. By 1840 commercial processes for electroplating silver had been developed. Large batteries and thermopiles provided the electricity. By 1870, the invention of the dynamo powered by the steam engine ignited the manufacturing boom that became the great age of silver plating. The first silver electroplated items were made from copper, that being the base metal familiar to the makers of Sheffield plate (see above), and 'flatware' such as spoons and forks continued to be made from copper alloys, usually copper and nickle known as 'nickle silver'. Soon, however, silversmiths began to use a tin alloy called britannia metal as the base metal for electroplated 'hollow ware', i.e., tea sets, candlesticks, centerpieces, etc.. Tin is a soft white metal easily formed and engraved. This innovation allowed nineteenth century silverplate to become extremely ornate and lavishly engraved. Britannia metal was the base metal for silverplate up until the first world war when silver manufactorers around the world were pressed into service making brass gunshells. By the end of this conflict silver makers had installed the stamping and spinning machines necessary to make things out of brass and other copper alloys so, when they resumed making silver plate, it was sensible for them to switch to these newer, harder, less expensive materials and britannia metal was almost entirely replaced as the base metal of choice. The sleek new styles of the Deco period lent themselves to these new hard metals which could not be so easily cast and engraved. Twentieth century silverplate is largely made from copper and the copper alloys brass and nickle silver (EPNS). At the end of the second world war there was a wedding boom (followed by the baby boom) at a time when people had little money for silver wedding gifts. Manufacturers responded by introducing 'gift silver' product lines and finding cheaper ways to make silver plate. 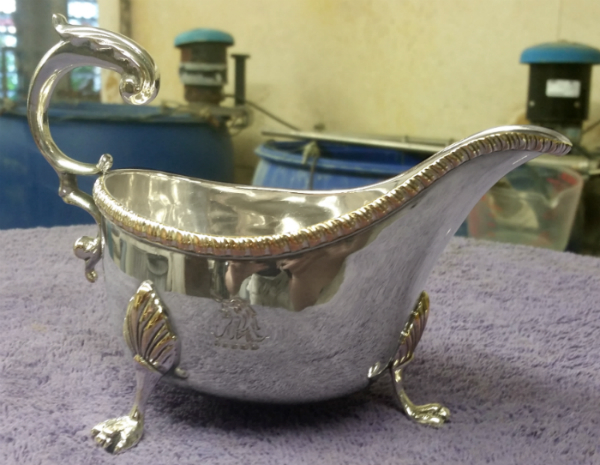 As a result, older silver plate is always better quality and, while the price of restoring an old piece may approach the cost of buying a new piece, it's usually worthwhile. They just don't make them like they use to. What Does Quadruple Plate Mean? Electroplating solutions have evolved over the years. In the early days they were not much more than silver cyanide and sodium cyanide with lots of organic contaminants in the mix. The silver that was deposited on the base metal was rough and dull and had to be polished quite a bit in order to make it shine. This polishing removed so much of the deposit that they had to plate the pieces over and over again just to build up a sevicable thickness of silver. You will see some pieces marked "triple plate", but more often "quadruple plate".